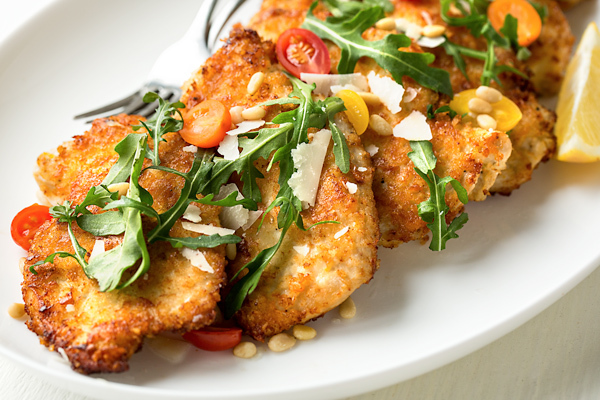 Golden, crispy and juicy, this parmesan crusted chicken is kissed with a hint of lemon and garlic, and is the perfect healthy and easy meal! 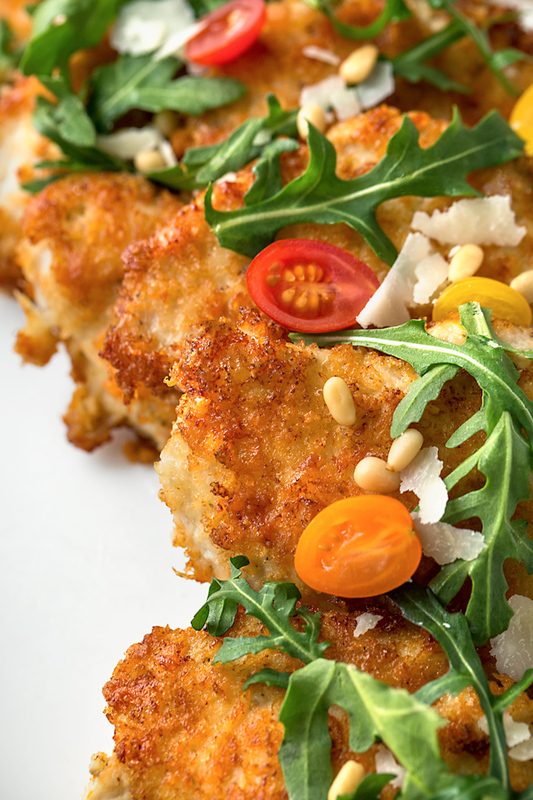 Parmesan Crusted Chicken, So Crispy, Golden and Delicious! Chicken is one of my favorite proteins, and probably the one that I cook with most often; it’s so versatile, easy to prepare and inexpensive. I even adore the rustic deliciousness of a whole roasted chicken served with nothing more than perhaps a good loaf of bread and some white wine! 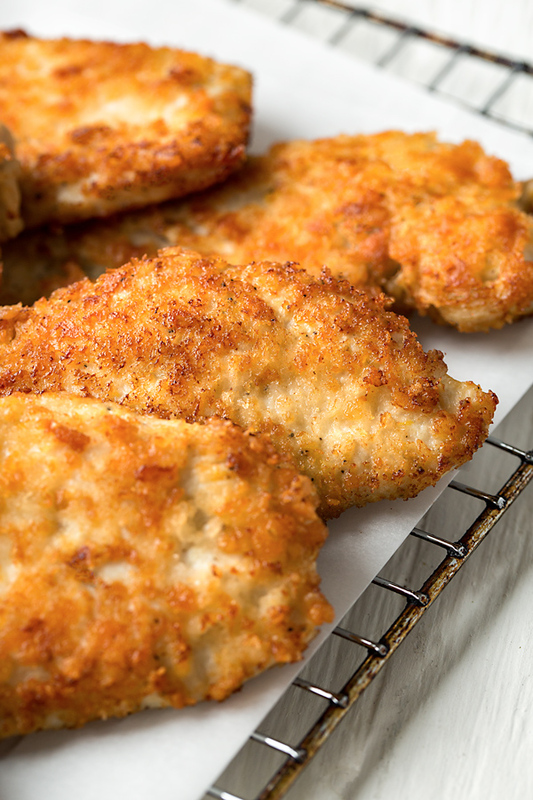 But parmesan crusted chicken is one of my absolute favorite ways to prepare it, lightly breaded and seared until crispy and golden in just a touch of olive oil. It’s super simple, succulent, and flavorful—the perfect savory chicken dish. When served with a sprinkle of fresh greens dressed simply with some lemon juice, olive oil and sea salt, this parmesan crusted chicken recipe makes for a wonderfully light and healthy complete meal! I’ll let you in on one of my personal secrets when it comes to preparing this particular recipe: I always reach for good olive oil, fresh lemon and garlic, and a hefty sprinkle of salt and pepper to boost the flavor. Actually, those three simple ingredients add a lot in terms of flavor when it comes to any chicken dish. The touch of lemon juice tenderizes the chicken, the garlic makes it nice and savory, and the touch of olive oil makes it perfectly rich. I’ll often throw in a combination of dried herbs as well. For the crispy coating, I like the extra crunch that panko breadcrumbs offer. So I use the panko in combination with grated parmesan cheese, the key flavor component that helps to create that appealing, golden outer crust. And for this recipe, I don’t use the typical “dredging” method that calls for flour and eggs. I simply press the cutlets directly into the coating mixture. So the list of ingredients for this tasty recipe is super short and simple. I marinate my chicken breast cutlets in the olive oil, lemon zest and its juice, garlic, and salt and pepper for 20 minutes. My panko breadcrumbs get mixed in with my grated parmesan in a large bowl, and I press each chicken cutlet firmly into the mixture to coat every piece well. Once the chicken is coated, I heat some olive oil in a shallow non-stick pan and sear each cutlet for about 3 minutes per side, or until golden-brown, crispy and cooked through. I serve the chicken on a platter topped with some lemon slices and either arugula greens, watercress, or julienned kale greens tossed with olive oil, lemon juice, salt and pepper, and even some quartered cherry tomatoes and shaved parmesan for color. 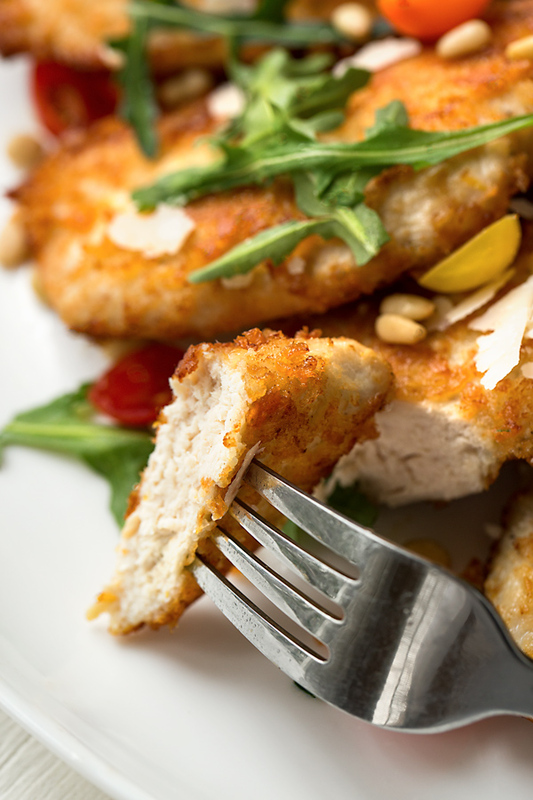 Skinless, boneless chicken breasts sliced into cutlets: I use four, skinless, boneless chicken breasts for this recipe. And because I like my cutlets nice and thin for quick cooking, I slice them in half length-wise to create 8 thinner cutlets. This keeps the cook time to roughly 3 minutes per side. Marination is your friend: I recommend that you marinate the chicken in the olive oil, lemon and garlic for at least 20 minutes, even for a few hours if you can. This helps to impart more flavor and juiciness! Choice of breadcrumbs: I love the crisp crunch that panko breadcrumbs offer; and in combination with the parmesan, they’re really tasty! But feel free to use traditional breadcrumbs, or even your favorite seasoned crumbs. Fresh grated parmesan: The flavor of the more freshly grated parmesan that you find in the refrigerated section of the market is what I prefer to use here, but you can also use any kind of grated parmesan you have on hand. Good oil for searing: I use a light olive oil for the shallow searing here. You can also use avocado oil, or safflower oil, or even vegetable oil. Healthy greens: If you’d like to serve some greens with this recipe, arugula is great. Watercress, julienned kale, rainbow chard, or even mixed greens are good as well. Just dress the greens with some lemon, oil, and shaved parmesan for extra flavor. Non-stick pan: It’s best to use a non-stick pan for this recipe, otherwise the light coating may be more prone to stick to the bottom. 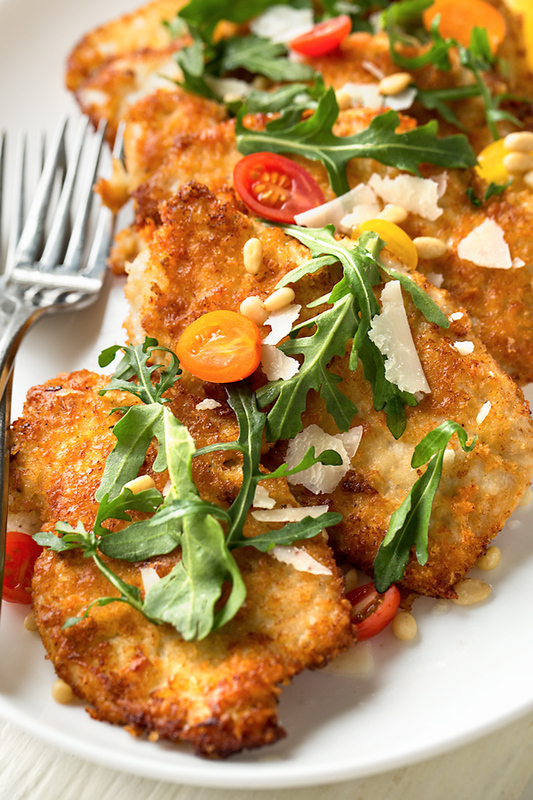 Crispy, golden and deliciously juicy, this parmesan crusted chicken is first marinated in lemon, garlic and olive oil for a touch of extra savory flavor. -Marinate the chicken breast cutlets in a large bowl with all of the ingredients up to and including the black pepper, and set aside for about 20 minutes to marinate. -In a large bowl, mix together the parmesan cheese with the panko breadcrumbs, and lightly dredge each cutlet by firmly pressing it into the mixture; hold on a plate. -Once all cutlets are lightly dredged, place large, non-stick pan over medium-high heat, and add a few drizzles of oil to coat the bottom of the pan, about 1/4 cup. -Once the oil is hot, work in batches searing the chicken, allowing the cutlets to become golden-brown on each side, roughly 3 minutes per side; keep the chicken warm until you’re ready to serve it. -Serve the parmesan crusted chicken (2 cutlets per person) on a platter on its own, or with lemon slices and topped with greens. Here’s a few more of my favorite chicken recipes: braised chicken thighs, arroz con pollo, grilled chicken with tomato-basil salsa, chicken cacciatore, or even a whole roasted chicken. Thanks, Madonna – chard and kale are definitely heartier greens, so they’ll need a nice strong vinaigrette to compliment them! You’re making eating healthy look beautiful. Love it! Keep it up! Lovely blog. 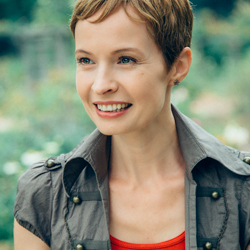 Hi Noelle, thank you so much for your wonderful comments! are those pine nuts in the photos as well? curious as they aren’t mentioned in the ingredients here. Hi! I made this for my family last night and it was delicious! It’s perfect for a quick and healthy dinner during the week. Thank you for a great recipe! Hi Anita, that’s great! So glad to read that you all enjoyed! This was delicious! But, I flunked the coating test. When I flipped the cutlets most of the breading was left behind. Breading is my Achille’s Heel. Any tips? Oh no, Cyndi! You know, this can happen. The coating for these is a bit on the delicate side. Try to press the chicken cutlets into the coating mixture as firmly as possible, for starters. Shake off the excess, and re-press again, if necessary. HI, I made this tonight- It was excellent- At first I had trouble with the coating too- but then I turned the heat down a bit and it seemed to be okay- Delicious! Hi Margaret, glad that worked for you! 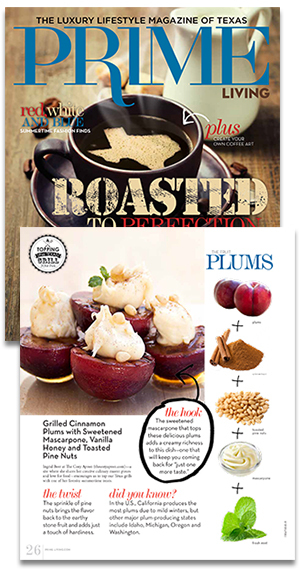 And thanks for sharing your experience—I’m happy you enjoyed this tasty recipe!